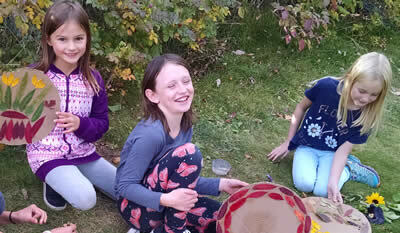 Cub Club Explores the Beauty Found in Nature :: Methow Valley Schools • Every Student Shines! Last year, nearly two-thirds of our elementary students participated in one or more Cub Club activities! Sponsored by the Public School Funding Alliance, coordinated by Katharine Bill, MVSD’s Family and Community Engagement Coordinator, Cub Club provides Methow Valley Elementary students in grades 1-6 with access to high-interest, engaging enrichment after-school activities that range from no-cost to low-cost for families. After-school transportation is provided to the Community Center in Twisp and Red Barn in Winthrop. We are forever grateful to our many community partners, some of which include: Methow Arts, The Merc Theater, Classroom in Bloom, Methow Nordic, The Winthrop Ice and Sports Rink, Methow Valley Fly Fishers, Methow Recycles, Methow Valley Riding Unlimited, Methow Valley Youth Soccer, and the many community volunteers that generously donate their time, energy, and passions to make enriching after-school activities possible. If you wish to learn more about the schedule of enriching activities and/or you’re interested in helping with any of these clubs, or you have another club idea you’d like to initiate, please contact Katharine Bill, MVSD Family and Community Engagement Coordinator at kbill@methow.org or (509) 341-4210.